Recent news from the World Economic Forum (weforum.org) has outlined recent core global economic functions and relationships (https://www.weforum.org/agenda/2017/03/worlds-biggest-economies-in-2017). We found this interesting in both factual data and interpreted data and we wanted to present our analysis to you, our valued members. 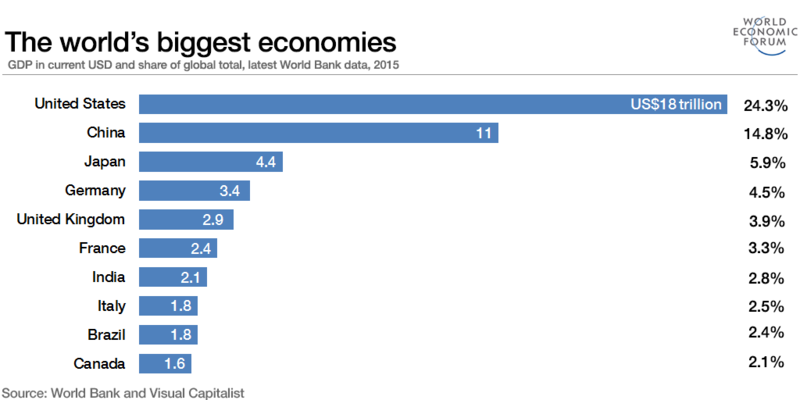 The factual data presented by the World Economic Forum is clearly showing that China’s growth as an emerging, diversified economy is already displacing some other emerging economies (India, Brazil, Italy, France and Canada). 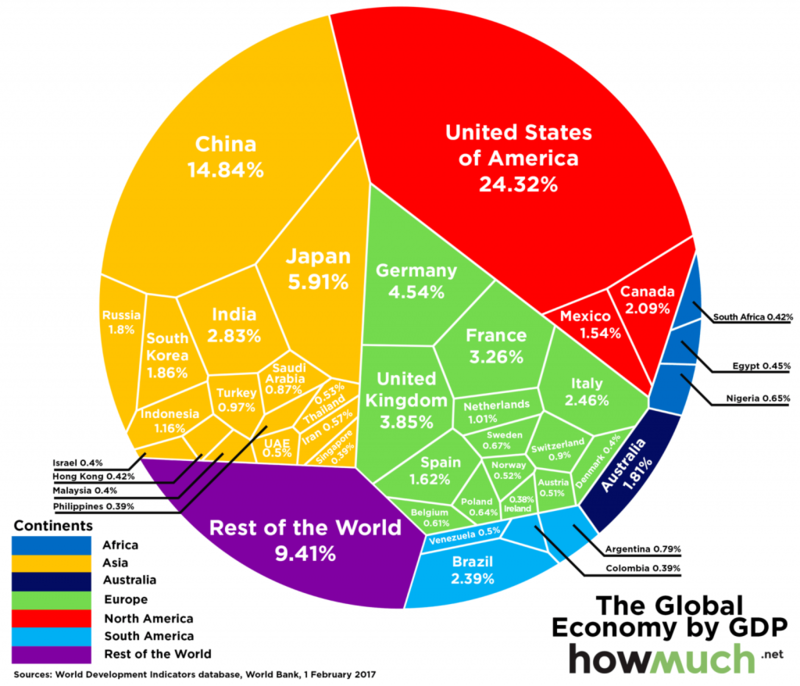 When we consider the maturity of these economies as well as their total output (see the infographic below), we begin to understand the mature global economies are likely saddled with more debt as multiple global economic crisis events have transpired since 2000. The graphic below clearly illustrates that many North American and European countries have gone further into debt since the initial Dot Com bubble event took place near the turn of the century (2000). Interestingly, many of the countries that have acquired so much new debt since 2000 are also the worlds largest economies and, therefore, are much more capable of experiencing continued economic growth cycles to address and pay down these debt expansions. It is our opinion that the expansion of debt across the globe since the year 2000 will find a means to propel economic growth in many of these most mature markets vs. transition to younger emerging markets with higher risks. Our opinion is based on two primary factors; longer-term economic growth and contraction cycles and the understanding that capital always attempts to move towards the safest net positive return venues at times of uncertainty. Although we believe certain opportunities will continue to exist in younger emerging markets, we believe these opportunities should be viewed as much shorter term rotational plays in global markets that may present a higher risk opportunity for valuation or price rotation. We strongly believe the major growth opportunities will continue to be present in the more mature and economically diverse economies that continue to drive global growth and propel many of the emerging markets opportunities. Recently, many people have been talking about the US GDP growth predictions and if the US growth will ever get back to near 3%. The word “luck” seems to pop up in regards to reaching this level ever again. We disagree with the concept that “luck” has anything to do with this level being reached in the near future. We believe the longer-term economic cycles will begin to play a more tangible role in all global economies over the next 3~7 years. We also believe these cycles will present major headwinds for certain emerging markets that may equate to contagion type crisis events for many. We believe these emerging market crisis events will drive investment capital away from many of these debt laden emerging markets as these events unfold and push capital investment into stronger, more stable, mature economies. This dramatic shift of capital deployment will further strengthen these established global economies and allow they to experience economic growth on a scale that has not been seen since the 1950s~1980s. Many people fail to realize the world has experienced at least 7 of these major cycle events in recent history (from the 15th century till now). Empires have fallen. Emerging markets have collapsed. Dynamics and wealth shift dramatically in the midst of these major cycle events and many times the strongest and most capable empires are the one that are able to restructure, rebuild and thrive. 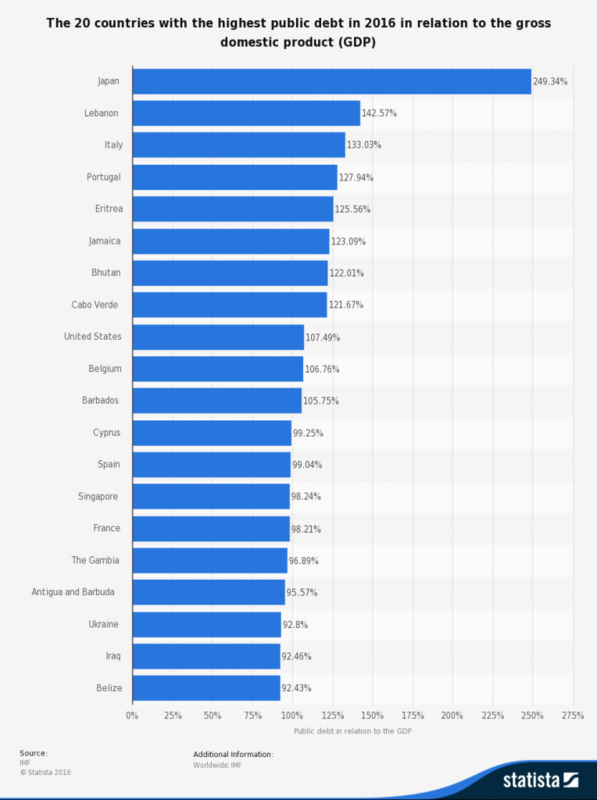 When we consider this list of the top 20 countries with the highest debt to GDP ratio, we see that nearly 80% of them are what we would consider “fledgeling economies”. Debt for these countries is a method of attempting to launch themselves onto the global playing field and a process of the easy money policies of the last 20+ years. The newer European Union and BRICs hype of the late 1990s and early 2000s likely drove many of these countries to have larger and larger debt requirements in an attempt to compete on a larger global level. Now, as we believe this major cycle event will begin to play out over the next few years, we believe the opportunity for investors will be to chase the rotation of capital around the globe as it attempts to find safe and stable growth opportunities. We believe the opportunities for strategic investors will be seen and experienced in global ETFs, major global Indexes, precious metals and currencies. We believe the opportunities for massive moves are just starting and key elements of the proposed global capital migration will begin to become noticeable over the next 6 to 18 months. If you wish to continue receiving our updates and detailed trading signals, please visit ActiveTradingPartners.com or TheGoldAndOilGuy.com. We keep our clients up to date with the highest levels of forward looking market analysis and trading opportunities. We welcome you to become a member and begin profiting from our shared experience. In closing, take a look at these sample Emerging market charts. Notice the multi-year downward sloping peaks correlating with global QE events. Notice how massive price rotation (30~60%) events happened when QE events ended or when these economies were left to operate without outside impetus? Now, imagine the price rotation that may occur with a major, “generational”, event cycle playing out? Where do you think all that capital will run to for deployment and safety? There are many new and exciting positions to be entered this month and we just added another two this week each with the potential for over 30% profit upon MRM breakout pattern. Visit www.ActiveTradingPartners.com today to learn more.